Dozens Of Mayors Sign Pact To Reduce Greenhouse Gas Emissions Mayors from across the country also agreed to meet goals similar to those in the Paris climate accord, which President Trump announced earlier this year the U.S. would withdraw from. Chicago Mayor Rahm Emanuel, (center) with other mayors from the U.S., Mexico and Canada at the summit, says, "There is an absence of leadership out of Washington" on climate change. Mayors from across the country say a lack of leadership in Washington on climate change is prompting them to take action themselves. 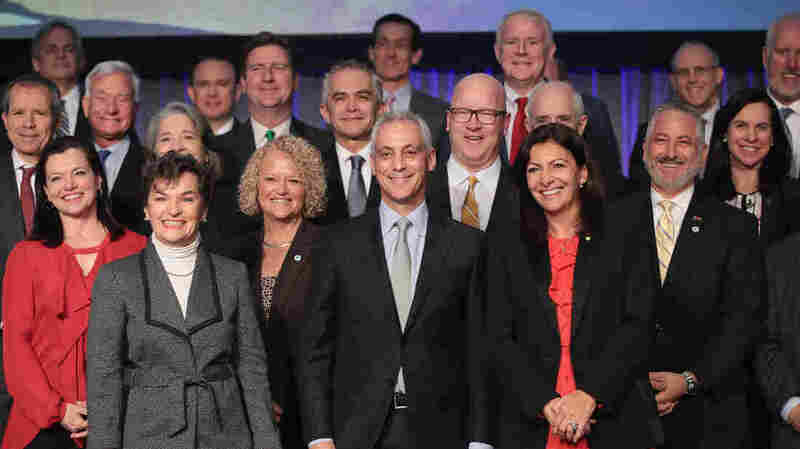 More than 50 mayors from cities large and small wrapped up a climate change summit in Chicago on Wednesday, at which they signed a formal agreement to reduce greenhouse gas emissions in their cities. They also agreed to meet goals similar to those in the Paris climate accord, which President Trump announced earlier this year the U.S. would withdraw from. Former President Barack Obama, who signed onto the Paris Agreement in 2015, lent his support to the mayors' actions in a speech to the North American Climate Summit on Tuesday afternoon. Obama pointed to rising sea levels, worsening droughts and storms and rising global temperatures as irrefutable evidence that the climate is changing. "Miami already floods on sunny days," Obama said. "Western cities across North American are dealing with longer and harsher wildfire seasons. A conveyor belt of some of the strongest hurricanes on record this summer smashed into Houston and Florida and Puerto Rico, and more than two months later, they are still struggling to recover." "Obviously ,we're in an unusual time when the United States is now the only nation on Earth that does not belong to the Paris Agreement," Obama continued. "And that's a difficult position to defend. But the good news is that the Paris Agreement was never going to solve the climate crisis on its own. It was going to be up to all of us." Obama told the told the mayors attending the summit that they are America's new front-line leaders on climate change. He said the most important work addressing climate change isn't being done at the level of national leaders but on the ground. "And cities and states and businesses and universities and nonprofits have emerged as the new face of American leadership on climate change." Mayors from cities in Mexico and Canada joined their U.S. counterparts in committing to reducing carbon emissions. "We stand shoulder to shoulder with all of the U.S. cities and mayors that are committed to the Paris Agreement," said Vancouver Mayor Gregor Robertson, who added that Trump should listen to the mayors on the issue of climate change. "We're on that path and we know our American sisters and brothers are. We just hope the president of the United States wakes up" and recognizes the importance of addressing climate change. "There is an absence of leadership out of Washington," said Chicago Mayor Rahm Emanuel, who served as Obama's White House chief of staff. "As it relates to climate change, we can't afford, as leaders of our respective cities, the absence of leadership and the wrongheadedness of policy by President Trump. Can't afford it." Emanuel says the participating mayors are filling a leadership void created by Trump by signing a first-of-its-kind international charter agreement aligned to the Paris climate agreement that commits their cities to reducing greenhouse gas emissions that cause global warming and outlines specific plans for meeting the carbon emission reduction targets by 2025. "You may withdraw," says Emanuel, referring to Trump pulling out of the Paris Agreement. "But we're all in on the Paris protocols."